Ball Bearings are very versatile. They can be designed to accommodate radial loads, axial loads and combined radial/axial loads in a wide range of operating speeds. These characteristics combined with relative cost and compactness of design result in their universal appeal in industry. 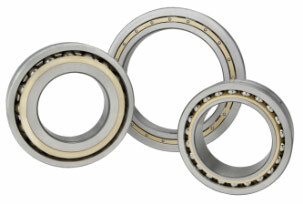 Ball bearings are widely used in electric motors, gear reducers, and pumps. American Roller Bearing manufactures ball bearings from 8” bore and above servicing heavy equipment: large motors, extruders, pumps, as well as specialty applications in steel and aluminum processing, oil and gas drilling, and mining applications. We can manufacture ISO standard designs or design and manufacture a bearing that meets you specific needs. Deep groove ball bearings are suitable for moderate radial or thrust loads and combined radial/thrust loads. Angular contact ball bearings have a greater number of balls and higher capacities than deep groove ball bearings. While single row bearings accommodate thrust in only one direction, these two row bearings are designed in a way that allows them to accommodate thrust in two directions.